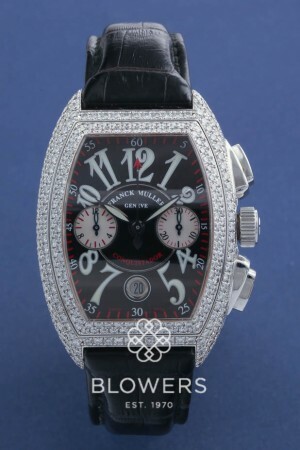 18ct White Gold Franck Muller Conquistador 8002 CC D. Chronograph, Factory set diamond case and bezel. Automatic movement. Black dial with silver second sweep sub-dial and thirty minute counter, with red track outer minute marker with numerals above the hour, date display at six. Luminous green numeral hour markers. Black croc strap, Box and Papers dated June 2003. Our Reference S20760. SKU: 3025081. Categories: Conquistador, Franck Muller.